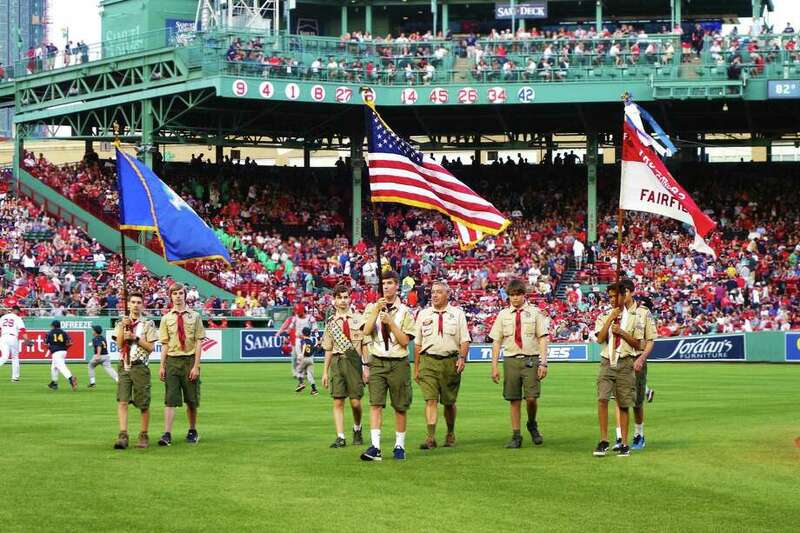 Seven members from Fairfield Boy Scout Troop 82 presented the American and Connecticut flags on the field during the national anthem before a nationally televised game at Fenway Park in Boston. Adam’s House invites the public to the third annual Ladies Healing Hearts Paddle Tournament at 8:30 a.m. Sept. 28 at area clubs. Proceeds from the event benefit Adam’s House, a nonprofit center in Shelton that provides free educational and support programs to Connecticut children and families struggling to cope with grief. Thirty-two teams will compete in the women’s-only paddle tournament held at multiple locations until about 2 p.m. Aspetuck Valley Country Club at 67 Old Redding Road in Weston will host the event’s luncheon, semifinals and championship game, but players also will paddle for a cause at Patterson Country Club in Fairfield, Weston Field Club and Wilton YMCA. “The Healing Hearts Paddle Tournament has been enormously popular, drawing competitive players and supporters, who enjoy a great day of play, plus lunch and a chance to win prizes, including tickets for the upcoming Jets-Patriots game,” said Adam’s House founder and Executive Director Allison Wysota. The winner will go home with three tickets to the Nov. 25 Jets-Patriots game, plus parking. JoyRide Cycling & Fitness classes and spa massage treatments also will be raffled off at the event’s luncheon. The cost is $200 per team, and tournament players are guaranteed three matches (weather permitting). The tournament includes the luncheon, drinks and a favor. To register online, visit bit.ly/adamshousect_2018paddle For additional details, contact Anne Santa-Maria at annesantamaria@optonline.net or Susie Minkowitz at ssmlmink@aol.com. Asbury Shorts, New York’s longest-running short film exhibition and touring show, brings their nationally recognized 37th Short Film Concert to Fairfield for a second year on Oct. 1. The fast-paced, eclectic screening of world-renowned shorts takes place in StageOne at The Fairfield Theatre Company, with the first film blasting onto the screen at 7:30 p.m. Steve di Costanzo, the general manager of WPKN 89.5 FM radio, will serve as host. An concert is recommended for ages 16 and up. Asbury Shorts is celebrating the work of women directors in this year’s presentation. Highlights include “The Suitor,” a dark comedy from director Kate Riedl of Australia about a young courtship in the wilds of the Australian Outback. ; “The Drive” is the poignant story of Evie, a loving daughter who struggles with role reversals as she drives her aging parents to an assisted living facility; and director Amy Nicholson’s documentary “Pickle,” which examines the complicated relationships humans have with their pets. StageOne at The Fairfield Theatre Company is located at 70 Sanford St. Tickets cost $10 for general admission and can be reseved at www.fairfieldtheatre.org or by calling the box office at 203-259-1036. With its August bike ride, Southport-based TeamBrentWheels, the cycling arm of TeamBrent, has surpassed $5 million to fight childhood cancer through the PanMass Challenge bike-a-thon. TeamBrentWheels’ 53 cyclists joined 6,300 riders to participate in the 40 annual Pan-Massachusetts Challenge on Aug.4-5, raising $375,000 this year. While overall PMC funds go toward fighting cancer in general at the Dana Farber Cancer Institute, TeamBrentWheels’ monies target neuroblastoma cancer. This years funds, combined with monies raised by all TBW cyclists over its14 years, brought TBW lifetime funds to the $5 million level. With these funds, TBW has helped fund a special MIGB treatment room where nearly 100 children have been treated; developed and moved forward with work on a potential vaccine for neuroblastoma; and DFCI now provides a personalized treatment approach for relapsed neuroblastoma patients while moving closer to a personalized upfront approach. Over half of kids with high risk neuroblastoma are cured today versus 20 percent when TBW started. Members of TeamBrentWheels past and present will be invited to a special presentation at the Dana Farber Cancer Institute in October for an in-depth discussion of the neuroblastoma program. The Connecticut Audubon Society will turn back the clock for a special cocktail and buffet fundraising event at the Center at Fairfield on Oct. 5 from 6:30 to 9 p.m. The evening’s guest speaker will be President Theodore Roosevelt as portrayed by Joe Wiegand, a performer and scholar who is regarded as the country’s premier Teddy Roosevelt reprisor. “An Evening with Teddy: The Conservation President,” will honor Fairfield resident Judith Fay Richardson for her dedication and commitment to the Connecticut Audubon Society. The festivities will include cocktails, buffet and desserts, as well as a silent auction. Ticket prices start at $75 and can be purchased from www.ctaudubon.org/fairfield-home. All proceeds from the event will support the environmental education and conservation programs at the Connecticut Audubon Society’s Center at Fairfield. Joe Wiegand has entertained audiences with his portrayal of the 26th president at historic sites and museums around the world — including the White House on Roosevelt’s 150th birthday. An influential supporter of wildlife conservation and our national parks, Roosevelt he was known as the Conservation President. During his presidency, he helped establish 51 preserves for birds, five national parks, 18 national monuments, 150 national forests and he identified 91 bird species he saw or heard on the White House lawn. Roosevelt was also a contemporary of Connecticut Audubon Society founder Mabel Osgood Wright, a pioneer environmentalist and founder of the Society’s Birdcraft Sanctuary in Fairfield. Birdcraft later became an inspiration for the Theodore Roosevelt Sanctuary in Oyster Bay, Long Island, after his widow, who was seeking a fitting memorial for the President, visited the Fairfield Sanctuary. The Connecticut Audubon Society’s Center at Fairfield is located at 2325 Burr St. in Fairfield. For information about this event, visit www.ctaudubon.org/fairfield-home or call 203-259-6305, ext. 109. Last month, Fairfield Boy Scout Troop 82, under the leadership of longtime Scoutmaster Bryan LeClerc, presented the American and Connecticut flags on the field during the national anthem before a nationally televised game at Fenway Park in Boston. LeClerc received a call from the Red Sox organization in July asking if Troop 82 would represent the state at Connecticut Day at Fenway Park. Troop 82 immediately accepted, and seven young men from the Troop were selected to attend. After arriving in Boston, the Scouts were escorted into Fenway Park and onto the field by home plate to watch the warm-ups. Once game time arrived, Troop 82 marched to center field and stood at attention while the national anthem was sung. The cheers from the fans was deafening after the singing, and the troop marched off by the legendary Green Monster. The Red Sox provided seats for the Scouts to watch the game a few rows back from home plate, as well as gave each Scout a bag of infield dirt as a souvenir. For information, contact Boy Scout Troop 82 Community Relations volunteer Jeff Zakim at jeffzakim@gmail.com or 203-829-8205.